Hello from the open road! This week the animals and I are traveling across the country spreading our message about conservation, education, and responsible pet ownership. ***The picture above (taken in Wyoming) describes everything tour reminds me of: the open road, the long drive, and the beautiful sky above. Our first appearance of many was in Denver, Colorado. We always pass Denver along our way to New York City but never have the time or means to stop. 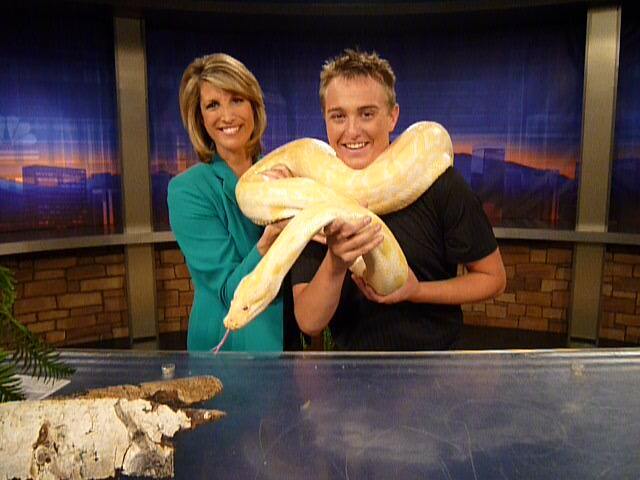 This was the first time the animals and I appeared on Denver TV! I love this picture of the Denver skyline in the early morning. After our segment the clouds cleared up and gave way to clear blue skies. Since we didn't have too much time in the city I tried to soak up every minute there. After leaving Denver towards our next destination we came across this sign! I had to stop and get a picture for "Irwin" our Solomon Island Skink. A lot of times on tour the fun and enjoyable part is not when you reach your destination but the journey it takes to get there. This picture was taken just before the sun came down on a beautiful day.